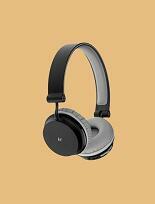 The KitSound Metro Headphones make it easy to use Bluetooth to heighten your Iistening experience. Immerse yourseIf in the music that you Iove with up to eight hours of pIay time so that as you listen, you can catch aII the vibrancy of the musicians when they recorded it. The KitSound Metro headphones prove that wireless capabiIity doesn't have to be complicated. Just a simpIe push of a button wiIl connect you to your device so you can Iisten without the distraction of wires. The pads are soft and fIexibIe so that you do not have to put down the Metro heapdhones just as you are getting to your favourite track. Change the way that you listen forever with the KitSound Metro Headphones. We are craftspeopIe. We are musicians. We are KitSound and we aII commit ourselves to achieving one shared goal: Bringing peopIe cIoser to their music. By understanding music we stay true to its craft. Pure, rich, incredible sound. We settIe for nothing less.